To recognize outstanding achievement in the field of organic chemistry, the significance of which has become apparent within the five years preceding the year in which the award will be considered. The 2017 Cope Scholar Awardees: Pictured: M.G. Finn, Paul J. Hergenrother, Alejandro L. Briseno, Thomas R. Hoye, Mikiko Sodeoka, P. Andrew Evans, Sherry R. Chemler, Guangbin Dong, Kathlyn A. Parker, Christopher D. Vanderwal. 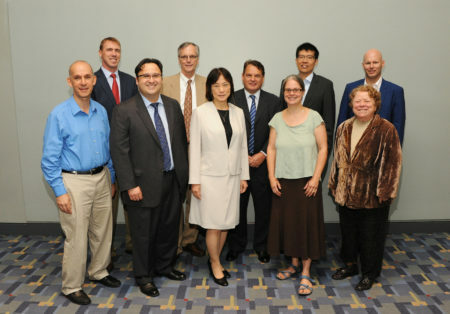 See the picture galleries (far left) for additional pictures from Cope Award Symposia. The award consists of $25,000, a medallion with a presentation box, and a certificate. Reasonable travel expenses to the spring national meeting at which the award will be presented and to the fall national meeting to deliver an award address will be reimbursed. The medallion will be presented during the award address. An unrestricted grant-in-aid of $150,000 for research in organic chemistry, under the direction of the recipient, designated as an Arthur C. Cope Fund Grant, will be made to any university or nonprofit institution selected by the recipient. A recipient may choose to assign the Arthur C. Cope Fund Grant to an institution for use by others for research or education in organic chemistry. In 1972 the ACS Board of Directors accepted responsibility for administering an award created under the terms of the will of Arthur C. Cope. Arthur Clay Cope,was born on June 27, 1909 in Indiana. In 1929 he received the bachelor’s degree in chemistry from Butler University in Indianapolis, then, with the support of a teaching assistantship, moved to the University of Wisconsin for graduate work. His thesis advisor at Wisconsin was S. M. McElvain, whose research program included the synthesis of organic compounds with possible pharmaceutical uses-especially local anesthetics and barbiturates. Cope’s thesis work was completed in 1932. In 1933, he moved to Harvard to work with E. P. Kohler. In 1934, Cope accepted his first academic position, associate in chemistry at Bryn Mawr College. After spending a summer at the University of Illinois as an assistant professor in 1935, he was promoted to the same position at Bryn Mawr and to associate professor in 1938. While at Bryn Mawr, Cope spent some time trying to determine the structure of Grignard reagents by precipitation procedures. Cope eventually directed his attention to developing new synthetic reactions for substituted barbiturates and novel aminoalcohol local anesthetics. More important for organic chemistry as a whole was his discovery of a facile thermal rearrangement from one carbon to another in a three-carbon system of an allyl group. In 1939, Cope’s career was given a boost through his election as secretary of the Organic Division of the American Chemical Society. In 1941 he moved to Columbia University as associate professor, and when World War II started, joined the Office of Scientific Research and Development as technical aide and section chief of Division 9 of the National Research Council. He was responsible for projects ranging from chemical warfare agents and insect repellents to antimalarial drugs and, in 1946, received the Certificate of Merit for his contributions to the war effort. In 1945 he moved to MIT to head the Department of Chemistry, where he began to work on the synthesis of cyclooctatetraene which lead to various project directions including whole new areas of physical organic endeavor. One significant example is “valence tautomerism,” where a compound isomerizes reversibly without intervention of external agents (except heat) by processes in which bonds are broken and made, usually simultaneously. What Cope and his coworkers discovered was the change of 1,3,5­ cyclooctatriene into bicyclo[4.2.0]-2,4-octadiene. One of the last important achievements of Cope’s research program was his ingenious resolution of the optical isomers of trans-cyclooctene and trans-cyclononene. After the war, Cope began to expand his service to chemistry on the national scene. In 1945, he was appointed to the editorial board of Organic Syntheses and he was the Organic Reactions’ editor-in-chief from 1960 to 1966. He served the American Chemical Society with great distinction: chairman of the Division of Organic Chemistry in 1946; councillor (1950-1951); president of ACS (1961); and chairman of the Board (1959-1960, 1962-1966). Among other accomplishments as an American Chemical Society leader, Arthur Cope had much to do with averting collapse of Chemical Abstracts around 1960, a time when chemical abstracting services were failing. He died suddenly on June 4, 1966 at the age of fifty-six in Washington, D.C., where he had gone for American Chemical Society and National Academy of Sciences business.